Enjoy Ultra luxury lifestyle at Vaswani Exquisite! Vaswani Group is a renowned name in the real estate sector for the last 33 years. It has come up with excellent commercial and residential real estate projects across Goa, Pune, Mumbai, and Bangalore. They have the incredible record of success and they are committed to continuously refining their skills and deliver innovative and value for money projects. They are experts in providing luxurious apartments which are equipped with international amenities. 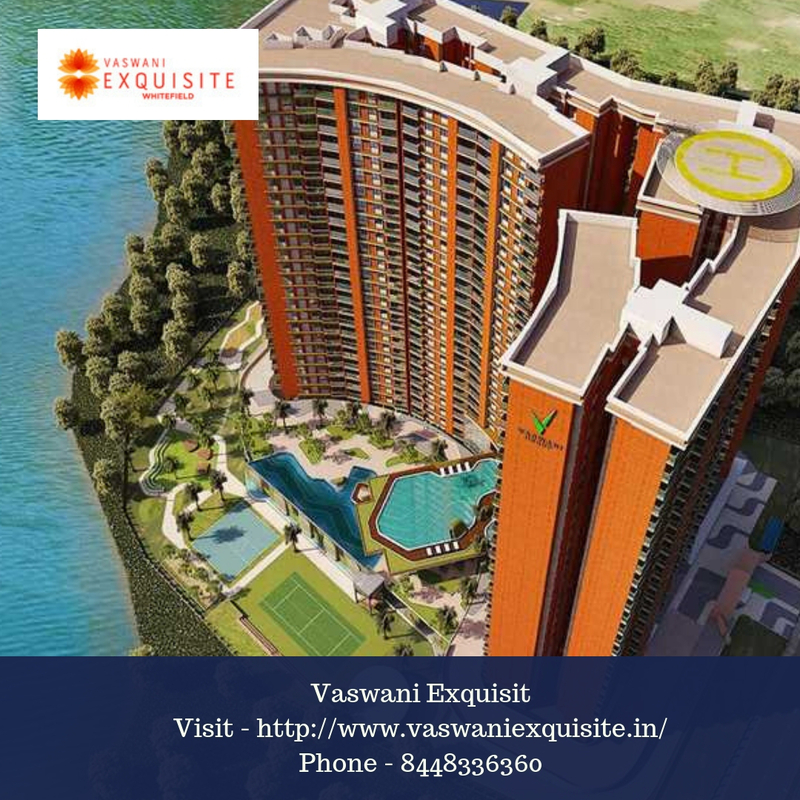 Vaswani Exquisite is a new project by the company that has 3 and 4 BHK luxury homes. The project has beautiful lake facing apartments. These residential apartments are spread over 4.5 acres of land. This beautiful project has four towers and there are 25 floors in each tower. This residential project has 3 and 4 bedrooms-luxury homes, which are ranging from 1820 sq. ft. to 2850 sq. ft. On request, you will get the Vaswani Exquisite Price. Going to the deep details will make you fall in love with this residential project. Its handpicked marble, extra high ceilings, glasses on every balcony, and so on are just the starting of luxury. You will find these apartments as luxury as some high-class hotel. This project has a helipad on its roof. Isn’t this interesting? The opulence can be seen in each part of the complex. The lavishness can be easily observed in the swimming pool. This place also has great landscape walkways and serene gardens. Vaswani Exquisite Bangalore project has an international style club-house and spacious gym and health club. This is not some ordinary clubhouse as it is spread across 25,000 sq. ft. and is spread across three levels. Get refreshed while playing basketball and tennis ball with your friends. An in-house relaxing massage is a great thing to do for calming your nerves. Getting indulged in a yoga class will let you feel inner peace. This residential complex has each and everything under one roof to enjoy your life. The large landscaped gathering place is present for your get together parties. The whole residential complex is having a rainwater harvesting system. It is the right place to live in this place as it has lots of world-class amenities. 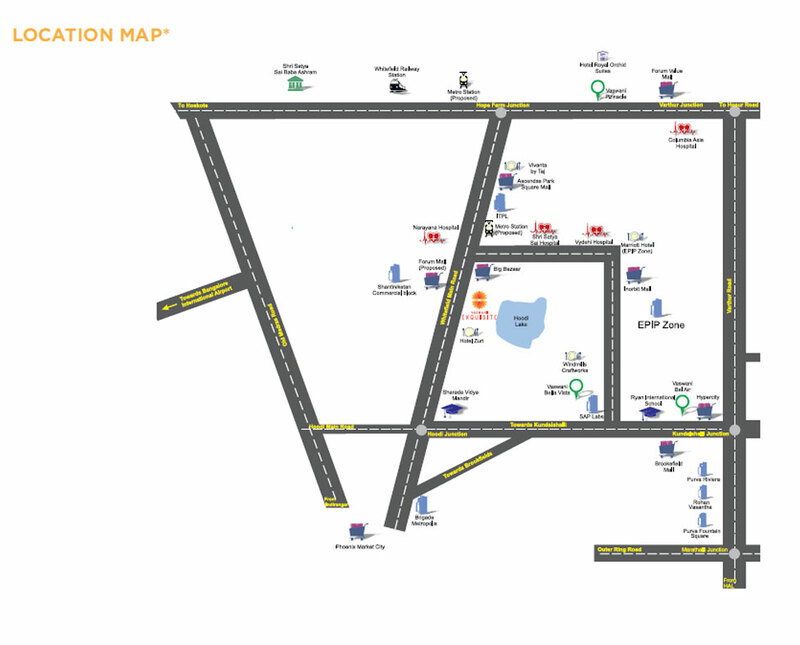 The location of Vaswani Exquisite Whitefield perfect as it is excellent connecting to rest of the city of Bangalore. In neighbourhood shopping malls, train stations, bus stops, metro stations, hospitals and schools are present. You will have easy access to the Ascendas Park Square Mall, Inorbit Mall, Forum Value Mall, Brookfield Mall, and Phoenix Market City. Narayana Hospital, Satya Sai Hospital, Vydehi Hospital. Brookefield Hospital, Yashomati Hospital, and Columbia Asia Hospital are present at the distance of few kilometers only. It will be a wise decision to invest in such a delightful and spacious residential apartment where luxury is so common. This location is already witnessing the rapid urbanization and global lifestyle and therefore, the place is attracting many developers. Therefore, investing in such a project will give excellent returns in the coming years! 24 storey towers designed around concept of “Room with a view”. 3 & 4 BHK signature homes ranging from 1820 to 2850 sq.ft. Generous ceiling heights, airy rooms and imported marble flooring. Large balconies to enjoy the unhindered views. Designed by leading international architects & landscape consultants. 25,000 sq.ft Clubhouse with world class amenities spread across 3 levels.